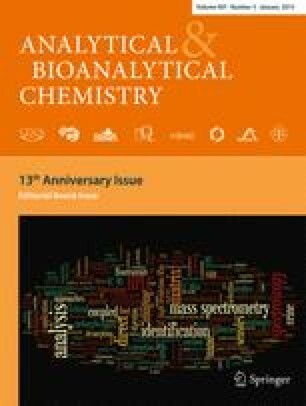 The comprehensive approach for the lipidomic characterization of human breast cancer and surrounding normal tissues is based on hydrophilic interaction liquid chromatography (HILIC)–electrospray ionization mass spectrometry (ESI-MS) quantitation of polar lipid classes of total lipid extracts followed by multivariate data analysis using unsupervised principal component analysis (PCA) and supervised orthogonal partial least square (OPLS). This analytical methodology is applied for the detailed lipidomic characterization of ten patients with the goal to find the statistically relevant differences between tumor and normal tissues. This strategy is selected for better visualization of differences, because the breast cancer tissue is compared with the surrounding healthy tissue of the same patient, therefore changes in the lipidome are caused predominantly by the tumor growth. A large increase of total concentrations for several lipid classes is observed, including phosphatidylinositols, phosphatidylethanolamines, phosphatidylcholines, and lysophosphatidylcholines. Concentrations of individual lipid species inside the abovementioned classes are also changed, and in some cases, these differences are statistically significant. PCA and OPLS analyses enable a clear differentiation of tumor and normal tissues based on changes of their lipidome. A notable decrease of relative abundances of ether and vinylether (plasmalogen) lipid species is detected for phosphatidylethanolamines, but no difference is apparent for phosphatidylcholines. Published in the topical collection celebrating ABCs 13th Anniversary. The online version of this article (doi: 10.1007/s00216-014-8272-z) contains supplementary material, which is available to authorized users. This work was supported by ERC CZ project No. LL1302 sponsored by the Ministry of Education, Youth and Sports of the Czech Republic. E.C. acknowledges the support of the grant project no. CZ.1.07/2.3.00/30.0021 sponsored by the Ministry of Education, Youth and Sports of the Czech Republic. The help of Blanka Červená and Vitaliy Chagovets (University of Pardubice) in the extraction and data analysis and Martin Hill (Institute of Endocrinology) in the statistical evaluation is acknowledged.